Struggling Venezuela already is producing oil at a multi-decade low, but the socialist nation's crude output could fall another 50 percent by 2020, according to a new report. 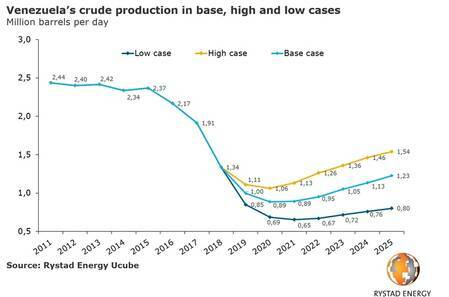 In Rystad Energy’s base case forecast, Venezuelan production drops by another 340,000 bpd year-on-year to 1 million bpd in 2019, and slips even further to 890,000 bpd in 2020. In the low case scenario, where the status-quo continues and Venezuela is unable to offset the effects of US sanctions and secure new financing, the country could see an additional 20% reduction in crude output this year, dropping to about 800,000 bpd, before sliding to 680,000 bpd in 2020. Finally, Rystad Energy’s high case scenario considers the effects of a regime change in Venezuela, where US sanctions are lifted and new financing agreements are secured. Here the country is able to slow the downward trend, with crude production sliding to 1.11 million bpd this year and on to 1.06 million bpd in 2020. One key factor is that Venezuela relies on imported diluents that are then mixed with the heavy crude produced from the Orinoco Belt in order to make the product marketable. Venezuela currently imports 60,000 bpd naphtha from the US, mainly from national oil company PDVSA’s US refining subsidiary, Citgo. “Rystad Energy forecasts that some operators in Venezuela will run out of the crucial diluent by March. Without diluent, the current 200,000 bpd of heavy crude exports is at risk,” said Rystad Energy analyst Paola Rodriguez-Masiu. Rystad Energy also forecasts what could happen in the case of a regime change that leads to the lifting of US sanctions and attracts new financing agreements.